We're now a good ways into the month of April, and you know what that means. It's time for another public online Hegel Q&A and discussion session. Everyone who has an interest in Hegel, dialectical philosophy, German Idealism, or even philosophy more generally is welcome to attend and participate! We'll be holding the session via video-conferencing using our ReasonIO FreeConferenceCall site - which you can access here. It runs between 5-6 PM Central Time (so you'll want to check your time zone difference). We often veer off into tangents during the discussion, depending on who shows up and what they want to talk about. But I do give priority to any Hegel-related questions and discussions. So if you've been puzzled by Hegel's philosophy, want to chat about it, or even just want to listen in, you're welcome to join us! 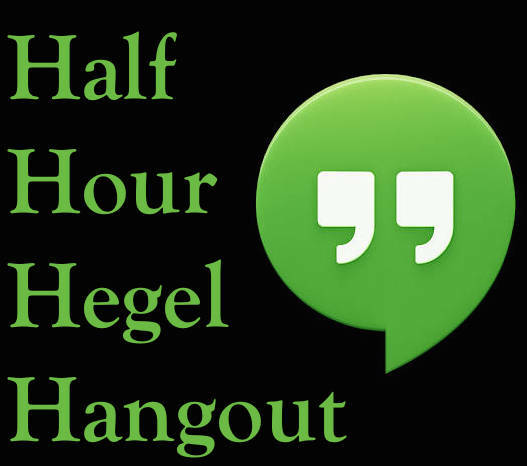 We provide these free online sessions every month - and my time and work devoted to them are underwritten by the supporters of the Half Hour Hegel project. If you'd like to help me continue creating videos in the Half Hour Hegel series, and offering online events like this, become a supporter on Patreon!